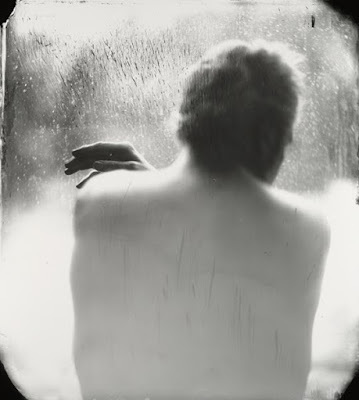 By any conventional measure this is a simple picture, a man (the photographer’s husband, actually) stands in front of a window – it contains little more than a gesture. The coal-dark, utterly physical blackness of his hand, which is the work of hands, of human endeavour and human frailty – of what we build and what falls from our grasp, work in forges, farmlands, the commonality of work, and its violence, breaking open, tearing apart, the violence of creation, contrasted against the sheer, milky expanse of glass filling the picture. It is a borderland of material (and immaterial) realms, between the embodied self and its dissolution, suddenly or by degrees, to where we cannot cross, but so close now that it occupies everything, there can be no other view. The seeming imprecision of her photographic technique, its material presence like something out of time, or perhaps belonging to a different age – a lost continent, gives the picture in turn a kind of emotional acuity that cuts away any sentimental mask. It’s just a man, alone and whether through a long exposure time or a shallow depth of focus, the figure is blurred, his naked back and the slightest hint of a profile still recognisable, but mostly indistinct. Yet if otherwise ghost-like, the hand is still that of a man, it is the potentiality of touch, and of desire. He looks out, searching for his reflection, but what he might see is not legible, not in the photograph. Arguably though, the picture is not about that, not about what he sees, or what we see – it’s about her seeing him, knowing his fragility, knowing whatever we touch is dust and ash. 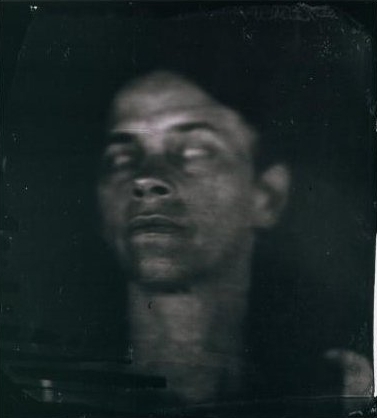 Sally Mann’s Proud Flesh is arguably one of the most powerful examples of a woman looking at a man in the history of photography, maybe it is even unique, a synthesis of all that has made her work so important and here finding its natural limit. The hand too, in this picture, is not held in a gesture of resistance; it doesn’t push against the impenetrability of the glass, but is just finding its own margin. He would be divided, the blackened hand, the whiteness of the glass – he can’t touch what is out there, it might as well not exist. Perhaps death is the final intimacy, but not just the last. Nothing ends, in that sense; our most fundamental relationships are never so convenient. Nor should they be, and all of that is resting on the surface of this image – anchor for a diminished physicality, for the inchoate landscape outside, that hand is the still point of two lives. She is fully conscious of his mortality, making us feel it as no doubt she does. That glass has the terrible, whispering finality of whatever divides the living from the dead, looking in and no longer looking out, distances that cannot be crossed. The hand is still then – nothing more to be done, no work, no warmth. She seems in recent years to have been turning the camera on herself as well, with the same fierce intensity, and the same intimacy, but producing markedly different results, because if the defining quality of a conventional photographic portrait is to assert the reality of how we present ourselves – of how we want to be seen by others and to conceal whatever seams join the pose with the actuality, these go to another extreme, which is a kind of conscious self-erasure. That boundary between the person and how they are photographed is so much a part of the picture that their conflict becomes the picture, the rejection of performance, of portraiture itself, its natural artifice. 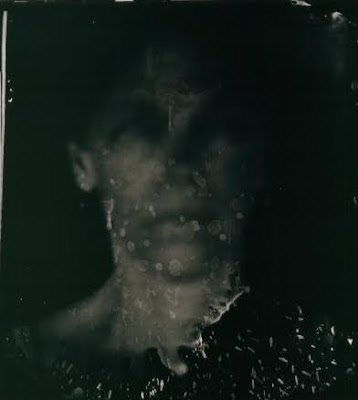 She forces the very idea of portraiture into a state of near perilous decomposition, revealing its volatile essence. Of course, whatever seems the most assured in its reality – our own sense of self – is often the most precarious, the illusive certainty we have made the foundation of our lives, that nothing falls, ever, until it does, and all in pieces. By the sheer length of these exposures, their accumulation of time, her appearance is shattered by forces it cannot contain, Mann reveals the margin of a coherent self – she is photographing her own death. It is a challenge, pre-emptively rehearsing the inevitable, as a doomed attempt to conquer it, where the picture becomes a talisman, a kind of sympathetic magic – after all, who can submit to the indifference of time, or even accept it? The view of her own mortality here is the inverse of what we see in the pictures collected as Proud Flesh. 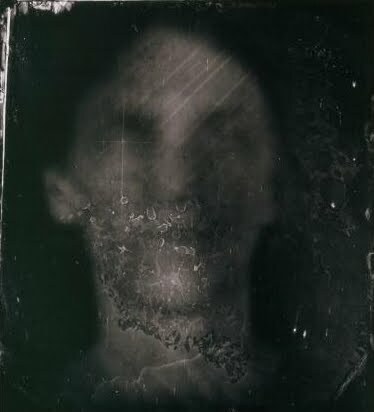 It is the photographic process itself that lets her be obliterated, revealing the invisible departure of life, moment by moment, whereas death is written on his body by illness, and the camera is just an observer, distraught but helpless, it does not create his disappearance – it is a measure only. She is brave enough to let her death match his, a gradually diminishing physicality mirrored by the photographic trace of absence. We don’t really think that the future will happen without us and of course, it does, because there’s only so much we get to see. Time’s arrow will pierce us all, eventually. These pictures find two distinct ways to unravel the implicit codes of our mortality – just as we are unravelled in turn, a slow drift from the centre, everything that moves together and then, apart. She is charting the limits, knowing there are only a finite number of times we will again see the light in someone’s eyes, or even our own – and who knows when will be the last. All we can know is there is a last… Yet if it was only that then these pictures would be almost unbearable, and they certainly are not. The balance between her knowledge of mortality and her endurance is carefully maintained, so that loss might not scrub all pleasure from the surface of the world – now is not forever either, but perhaps it is enough.